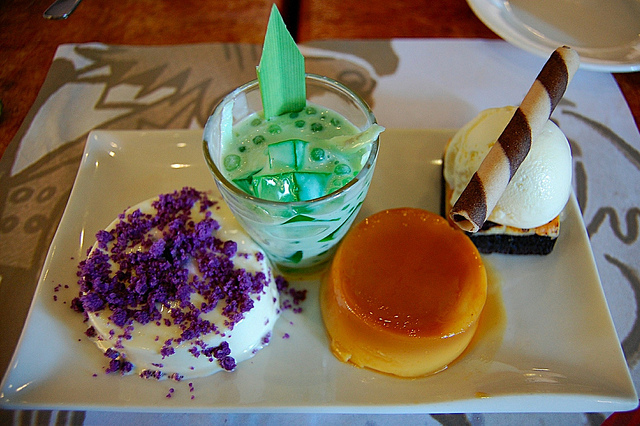 Culinary Historians of Chicago presents The Frosting on the Filipino Cake: A family carries on their matriarch&apos;s dessert legacy, at Kendall College. Mrs. A. Cupcakes chef/owner Delia Anama, who grew up in her native Philippines, will demystify Filipino desserts and delicacies. This event will be recorded for WBEZ’s Chicago Amplified, but you must attend to taste Mrs. A&apos;s samples of sweet Filipino rice cakes. Admission $5, $3 for students, and FREE for Culinary Historians of Chicago members and Kendall students and faculty. The Sugar Beet Co-op celebrates its first year with a Membership Kick-off Party and Winter’s Eve Farmers Market at Unity Temple in Oak Park. The Frank Lloyd Wright 1909 modern masterpiece will be transformed with magical candlelight and local vendors with beer, wine, seasonal snacks, and live jazz. Admission $20. Pintxo the Perro and Tavernita and Barcito chef/partner Ryan Poli kick off Amigos de Pintxo 2.0: A series of all-star guest chef friends making San Sebastián inspired bites — all-you-can eat and for a cause no less — at Barcito. Lee Wolen of The Peninsula Chicago and Phillip Foss of EL Ideas will serve their take on Basque pinxtos (tapas), this week benefitting Pilot Light. Admission $25. Baconfest Chicago presents the final pre-fest satellite dinner at Three Aces. Chef Matt Troost won the Golden Rasher award (Most Creative Use of Bacon) at Baconfest 2012, dinner session, for his bacon-bourbon milkshake which will be served. The full menu: First course of lemon-bacon cured scallop crudo with bacon glaze; second course of "shake n’ bake" bacon steak with bacon bolognese; third course of bacon-parmesan sformato (soufflé) with rutabaga agrodolce (sweet and sour sauce); fourth course of coffee cured pork belly with red flannel hash; fifth and dessert course of bacon-bourbon pecan pie with the award-winning bacon-bourbon milkshake — all paired with tasting cocktails and beers. Admission $75. Soup & Bread presents this week’s theme, Our Neighbors to the North: From Kenosha to the Arctic Circle, benefitting the Irving Park Community Food Pantry, at the Hideout. Publican Quality Meats supplies freshly baked bread all season, plus gluten-free loaves from Rae Lynn Hill, aka The Sweet Purveyor. Admission FREE, but please donate what you can and remember Everyone LOVES the Generous.